Today, I’m going to start by diving into React to build a TODO application that takes into account where I need to be to complete a task. I don’t “buy milk” while at home nor do I “cut the grass” when I’m at work. I want my TODO application to be smart and only show me tasks that make sense for where I am or where I’m going. 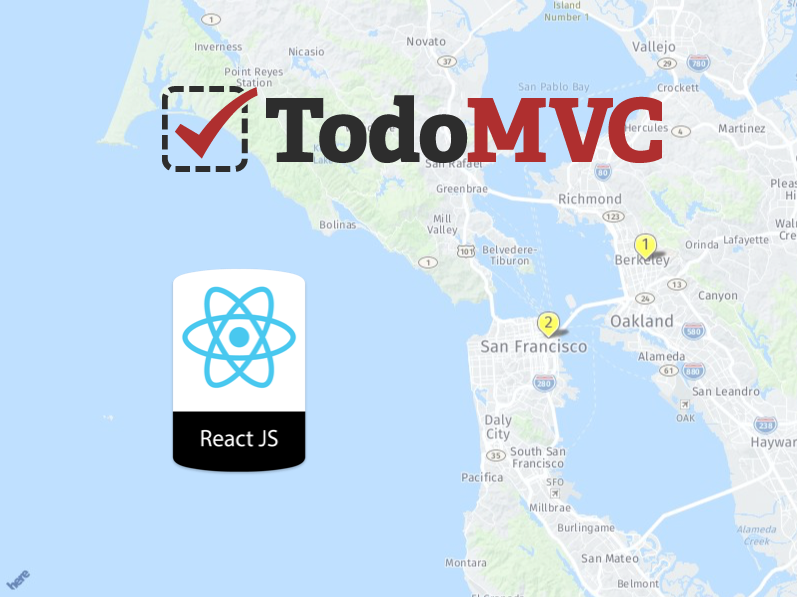 With the TodoMVC React implementation as a starting point we’re going to start adding location features. Additionally, there is a little bit of housekeeping to update the sample with the latest ES6 and React functionality. There are at least two paths for getting a “Hello World” started quickly. I prefer this approach, so when create-react-app finishes you should be able to view http://localhost:3000 with live reloading and a basic Hello World React App. A React component is a structure for creating independent, reusable pieces of a user interface. The component accepts properties as input and returns a React element that can be rendered. Review the following component source. It defines a simple text input box that defaults to the current location. There are inline comments to help describe some of the logic. t=5 specifies the rendering scheme so you can choose from various styles of map tiles including satellite, transit, etc. app_id=... and app_code=... are found in the here developer projects section and needed for working with any HERE APIs. Each of these parameters could be stored as either props or state on the component to provide rich customization options to users. The last parameter we want to send to the Map Image API is the poi= for a comma separated list of latitude and longitude for any markers we want to place. The poi query we’d want to make for these todo items would look like poi=37.86836,-122.26859,37.784117,-122.401386. Once defined, you can reuse this component in any other component such as the root app component. This first post introduced TodoMVC with a couple of very basic React components that leverage the HERE Map Image API. In upcoming React posts I’ll dive deeper into this example to respond to state changes with event handling for geocoding lookups, map clustering for TODOs at the nearby locations with conditional rendering, Matrix Routing to get between TODO locations efficiently, Place Search to find related TODO items, and a few other project integrations to polish up the final todo app. If you haven't yet, sign up for a freemium account to get access to use HERE services to build your own TODO app. You can follow the developer blog RSS feed to find updates as new articles are published or look for updates in the developer newsletter.